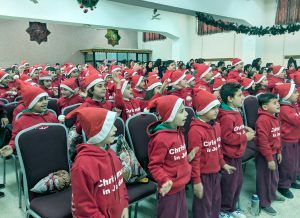 More than ever in Jordan: A number of Christmas for Refugees events were held in Jordan this year, more than I could attend. 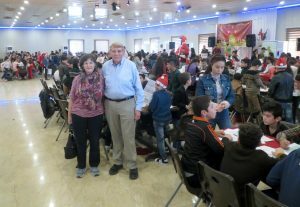 In all, my wife Nancy and I were able to attend three of the Christmas parties for refugee children in Jordan. Unlike in Lebanon, most of the refugee children in Jordan are Iraqi. The hoodies for the children in Jordan were made by Christians in the West Bank. All the children at our event in Marka, Jordan were Iraqis from the Nineveh Plain where we also held Christmas parties. At one of the Christmas parties, every single one of the children present was from Iraq, almost all from the Nineveh Plain. The children called off their names and hometowns one at a time for us, and most of the town names I knew, such as Qaraqosh, Bartella and Mosul. One church in Jordan is providing three hours a day of schooling for these 250 children from Iraq. One of the Christmas for Refugees events was held at the school. The children were incredibly well behaved but had fun. The church had requested that we supply Big Macs, fries and Cokes from McDonald’s for the kids because it was a treat that none of their families could afford. No meat can be served at the school because of the cost. We buy all services and products locally to help the economy there. The Christmas party in Qaraqosh not only encouraged the children but furnished income for local people. In addition, gifts were given to all the volunteers. The room we used was too large to capture in one photo. Here my wife Nancy and I stand near the center of the room. In all, 546 children were at this one Christmas party that lasted almost four hours. The length of each event varies depending on location and the difficulty in returning children to their homes. In Qaraqosh this process was relatively simple and the party lasted almost four hours, with different types of entertainment and of course all pointing to the real reason for Christmas, the coming of our Lord Jesus Christ. More than 1,500 children attended the three events held in Iraq while I was present. Every event was centered on Jesus, from coloring contests to puppet shows. There were also traditional Christmas line dances centered on songs about salvation. Christmas for Refugees is about hope and considering the devastation that has been done to Christian towns on the Nineveh Plain, these children really needed the hope and joy that can come from events such as these.